Can I enlarge the pictures? Almost all of the pictures can be viewed at their full size by clicking on that picture from any of the index pages. How can I order professional prints? Most of the pictures except those taken on the honeymoon and by other guests are available for professional reprints by our photographer, Donna Johnson. Pictures are available in various sizes, with 4x6 being the least expensive. Visit our ordering page for more details. You may also save and print any of the pictures you like. What are those gray and white bars on the right side of some of the pictures? 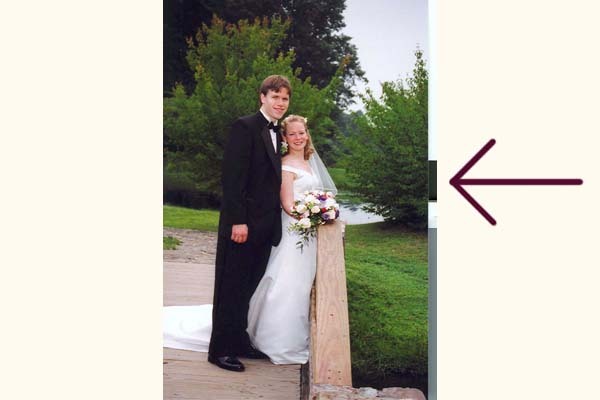 These gray and white bars were added to most of the vertical pictures by our scanner. They will not show up in the professional reprints if you choose to order them. If you want to print out a copy of one of these pictures, you may want to use photo-editing software (e.g. Adobe Photoshop) to crop out these bars.